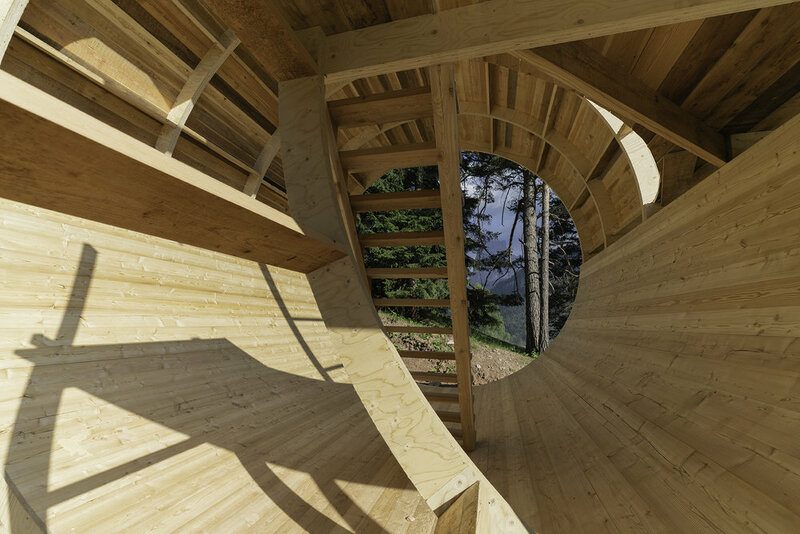 Jiří Příhoda’s Diogenes’ Barrel (Poetry Pavilion), conceived for the 6th Biennale Gherdëina, is both a chamber of contemplation as well as a performance space for the readings of poetry, written and composed by Alessandro De Francesco. Doubled cylindric structure reflects the dialectics of inside and outside, rendering simultaneously open and enclosed space, a sanctuary within a breathtaking scenery of the Val Gardena’s Col De Flam with a carefully framed view towards the mythical Sassolungo. Executed mostly of wood, the pavilion’s roof is made of a luminescent artificial stoneware Corralit, absorbing daylight and glowing in the dark, thus generating a magical effect on long Summer evenings and nights. Named Diogenes’ Barrel after eccentric Greek philosopher’s infamous dwelling of a large ceramic jar in the marketplace, Příhoda’s structure is a modest but, at the same time, unique and brave proposal of an all-immersive spatial environment which boldly rewrites the vernacular language while retaining a respect for the local tradition and style. As such, in a spirit of Diogenes - an exile and an outcast, a man with no social identity - who was credited with the first known use of the word “cosmopolitan” and who used to call himself "a citizen of the world”, the pavilion is a tribune for poetry as a medium practicing an universal language, a medium which is considered by Franco Bifo Berardi as “a hidden resource that enables us to shift from one paradigm to another”.